By Frank Cerveny, Global Head of Sales, MTS. This article first appeared on the Markets Media. Read the original here. In this series, we’ll discuss how automation can benefit the trader throughout the trade lifecycle and explore some of the tools and services MTS provides to support your automation efforts. In the second installment of the series, we consider the roles played by connectivity and liquidity in automation and the automation tools available to support post-trade processing. Traditionally the trade lifecycle is viewed as a three-step process, however trade execution can be considered as the sum of two parts: placing a trade and confirming a trade. With that in mind, once a trade has been submitted, the key to the success of any automated execution strategy is fast, cost-effective and straightforward connectivity to a diverse pool of counterparties. This is the only way to ensure deep liquidity and competitive execution costs. MTS BondsPro offers a wide range of direct connectivity options – all with straight-through-processing (STP) – including connectivity to over 50 API, OMS and web-based solutions to suit the diverse technology and budget requirements of buy-side firms. MTS has also partnered with Bloomberg to enable buy-side traders using Bloomberg’s EMS solution – TSOX – to trade in the MTS BondsPro liquidity pool directly from their Bloomberg terminals. MTS was the first unaffiliated electronic platform with a direct access trading connection to Bloomberg TSOX. It is a significant development for the buy-side, delivering access to a new global liquidity pool without any additional desktop real-estate requirements or integration costs. This is complemented by all-to-all trading, which is a necessity for non-traditional market makers to evolve and liquidity to grow. The emergence of innovative all-to-all trading models has further paved the way for an increase in non-dealer liquidity on electronic platforms, and flow is leading to more flow, which is leading to more innovation. By connecting to one all-to-all venue like MTS BondsPro, for example, an alternative liquidity provider such as an asset manager or algorithmic market maker can show its pricing and trade with 1,000 other end users from all corners of the market – with just one outbound connection. The growth in this type of trading has been significant – over 40% of the institutional volume on BondsPro in the first quarter of 2018 was from non-traditional liquidity, and that proportion has doubled each year since 2016. It’s clear that fast connectivity and deep liquidity are critical to automation strategies. But what about post-trade? The order has been decided upon, placed and swiftly sent through to one of the MTS venues, all supported by a range of algorithms and automation tools. But the work is not yet done. There are still a number of important post-trade tasks to perform, from processing to regulatory reporting and risk management. Here, automated tools can also provide support. They can help both to alleviate internal operational bottlenecks between the front, middle and back offices and streamline processes with third parties, such as clearing houses. For supporting the internal management of a trade, MTS enables automatic registration and STP. In the interdealer markets, MTS sends SWIFT and other settlement messages to the relevant CSD, ICSD or CCP on behalf of both participants to the trade. BondVision facilitates STP connectivity internally for clients via FIX or a variety of other blotter auto export mechanisms. This significantly reduces errors, cancellations and other issues that have an impact on an institution’s efficiency and profitability. 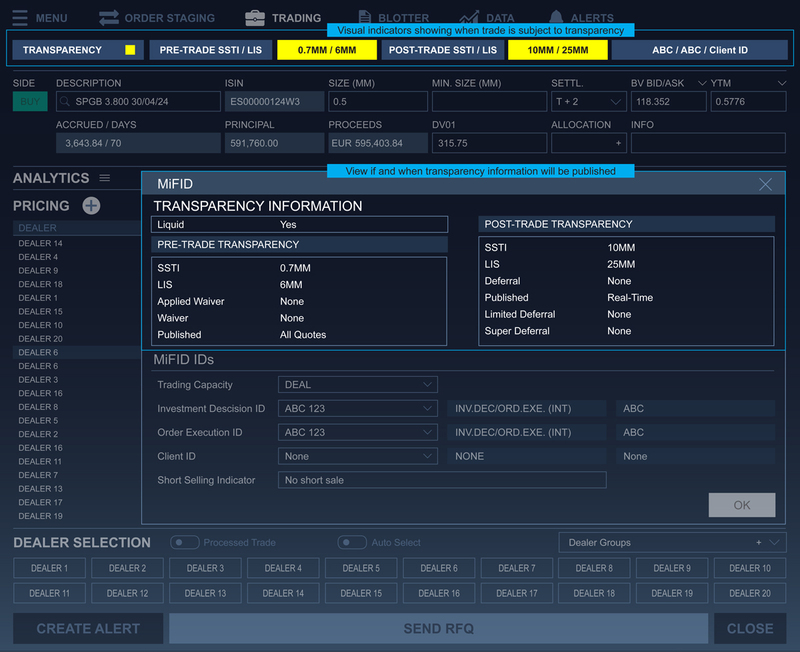 While manual trade processing can easily create discrepancies in the recording of data, or fail to spot problems, with automated tools traders can be confident that straightforward trades have been processed quickly and error free. This, in turn, frees the back office to focus on managing and reviewing more complex trades, making them more productive. For example, MTS BondVision offers automated reporting for compliance purposes, greatly reducing the burden of complying with regulations such as MiFID II and the forthcoming STFR. All trade information is exportable to Excel, all major order management systems and other systems. BondVision captures important trade information, such as price updates and personal identifiers, in highly granular detail in order to prove best execution and support transaction costs analysis, helping the trading parties comply with MiFID II. With the trade selected, booked, executed and processed, the trade lifecycle has come to an end. By taking advantage of automated tools at every stage in the journey, the trader is able to trade with greater accuracy and speed while minimizing the risks and costs of post-trade processing. Ultimately, automation is not about replacing traders with lines of code. Instead, automation provides tools which allow the buy-side and sell-side to increase their productivity at every stage in the trade lifecycle, driving profitability and returns for traders and investors.